There is growing evidence about differences in metastatic spread among breast cancer (BC) biologic subtypes (BS). Aim of this study was to analyze the pattern of metastasization according to BS and to explore the corresponding prognosis. 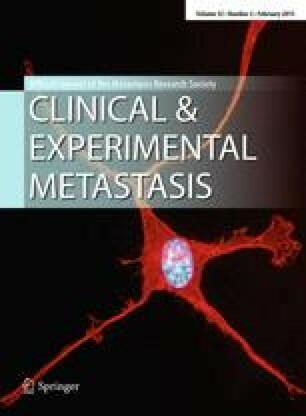 A series of 544 consecutive patients receiving anticancer therapy for metastatic BC from 2004 to 2013, was analyzed. BS were defined by immunohistochemistry according to St Gallen 2013 criteria. Association between BS and the different distant localizations was analyzed. Prognosis was described in terms of overall survival (OS), progression free survival (PFS) and post progression survival (PPS). Results were reported taking luminal A BC as reference. Triple negative BC showed a higher tropism for lung (OR 4.30 95 % CI 1.41–13.1), while non luminal HER2 subtype was associated with a higher rate of liver metastases (OR 3.61 95 % CI 1.36–9.58). All subtypes were associated with a lower risk of bone-only localization. Central nervous system (CNS) involvement was more common in HER2 positive BC (OR 6.3, 95 % CI 1.08–36.66). Liver, lung and CNS involvement influenced negatively OS (HR 1.64, 95 % CI 1.29–2.07; HR 1.49, 95 % CI 1.18–1.90; HR 2.891, 95 % CI 1.85–4.51, respectively) and PFS (HR 1.39, 95 % CI 1.13–1.71; HR 1.26, 95 % CI 1.02–1.55; HR 1.75, 95 % CI 1.12–2.71, respectively). Multivariate analysis confirmed liver involvement as independent predictor of worse OS (HR 1.64, 95 % CI 1.15–2.34). Stratification by metastatic pattern showed significant differences in terms of PPS but not in terms of PFS. The study suggests that BS may be characterized by typical patterns of metastatic spread and have different impact on clinical outcome.